Autumn foliage along the Park Loop Road in Acadia National Park, Mt. Desert Island. Maine is known for its natural beauty and its cultural and historical attractions; one of the best ways to experience this spectacular state is on a scenic drive. Maine is crisscrossed by scenic byways that make seeing the sights easy. In fact, of the 95 roads honored as National Scenic Byways, four are in Maine: The Acadia All-American Road, Old Canada Road, Rangeley Lakes Scenic Byway and Schoodic Scenic Byway. These special corridors were chosen for the unique scenic, recreational, natural, historical, cultural or archeological qualities that make them one of a kind. But even if your travel plans don’t take you to one of these four byways, Maine has many more to offer. From the rugged, rocky coasts Downeast to the endless northern forests, clear mountain lakes to quaint fishing villages, Maine’s byways allow you to experience the state first-hand. And, though these roads are lovely year-round, visitors who drive from late September through mid-October will be rewarded with stunning red, gold and orange foliage that transforms the countryside into a painter’s canvas. Known for its craggy coasts and wild scenery, the Downeast and Acadia region is home to the Acadia All-American Road and the Schoodic Scenic Byway. The 40-mile Acadia All-American Road leads visitors through old-growth forests, by coastal villages, around Acadia National Park and past Cadillac Mountain. Along the way, explore the historic vacation town of Bar Harbor, feast on that delicious Maine lobster and marvel at the ocean views from Otter Cliffs. Get back to nature on the Schoodic Byway; it transverses 29 miles along the less-populated side of Acadia National Park. From the wildlife-rich ecosystem at Taunton Bay to clamming at Long Cove, canoeing on Jones Pond to crashing waves at Schoodic Point, don’t forget your camera on this drive. Watch for puffin and seabird colonies as well as lighthouses dotting the shore. Other lovely drives in this region include the 8-mile Million Dollar View Scenic Byway, which winds by the Chiputneticook lakes, and the Blackwoods Byway, a 12.5-mile drive through blueberry barrens. Travel back in time on the Old Canada Road. This 78-mile byway traces the historical route between Maine and Quebec, passing by quaint villages and untouched wilderness along the way. The road’s southern portion is characterized by water — from the Kennebec River to Wyman Lake, and Moxie Falls to the Moose River – while the northern miles pass through pristine forest. The Maine Lakes and Mountains region is full of blue lakes and rocky peaks. 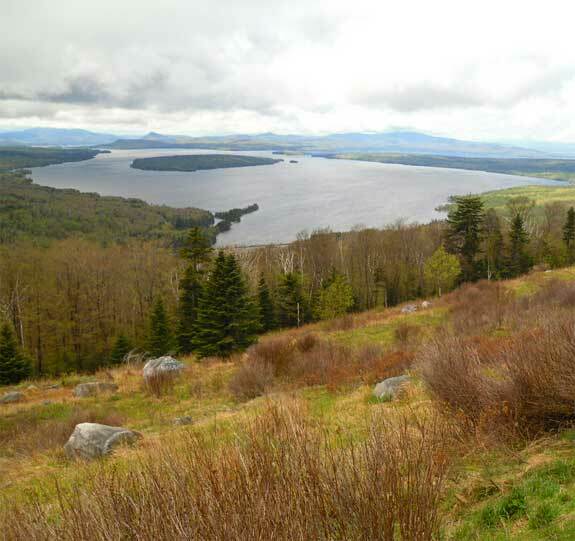 For year-round activities and scenery, the Rangeley Lakes Scenic Byway offers 36 miles to explore, following along rivers and streams and offering some of the best fall foliage around. Other attractions include the Wilheim Reich Museum and the annual Snodeo and Apple Festivals. Other notable drives in this region include the 37-mile State Route 27, 60-mile Pequawket Trail Scenic Byway and 21-mile Grafton Notch Scenic Byway. Maine’s largest, northernmost region is characterized by pristine forests, more-than 2,000 lakes and recreational and cultural attractions, from canoeing and skiing to the Potato Blossom Festival and Moose Stompers Weekend. Find out why the County is known as “The Crown of Maine” on State Route 11. This 47-mile road — which traces Benedict Arnold’s 1775 route — passes by historic villages full of eclectic shops and spots perfect for fishing, hiking and snowmobiling. Regardless of which road you choose, you’ll find a diversity of scenic, historic and cultural attractions along Maine’s byways. Height of Land on Route 17, overlooking Mooselookmeguntic Lake. in the Rangeley Lakes Region.